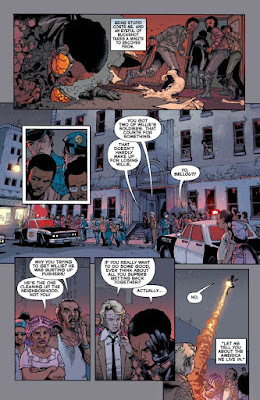 Eleven years ago, novelist and screenwriter John Ridley (best known then for Three Kings, now for 12 Years a Slave) teamed up with comics artist Georges Jeanty (best known for his work on the Buffy comics) to produce The American Way, a limited series about government-created superheroes in the Kennedy era. This summer they returned with The American Way: Those Above and Those Below, a sequel that revisits some of the same characters ten years later to capture them in a time of social and political upheaval. But if the intervening years haven’t been kind to the heroes, the same cannot be said of the comics: Those Above and Those Below is superior to its predecessor in just about every way possible. When The American Way was published in 2006, its criticisms of liberal hubris seemed fair but not especially timely; of all the problems America faced in the waning years of the Bush administration, the arrogance of Kennedy’s “best and brightest” wasn’t high on the list. Similarly, its criticisms of the superhero genre—the bold revelation that its superheroes were all frauds created for government propaganda—felt about twenty years out of date. The American Way: Those Above and Those Below feels a lot more contemporary. Set in 1972, it conjures a world of incendiary racial tensions, conservative backlash, and terrorist violence that looks all too familiar. Ridley has said that his story “predates any specific politics we’re going through right now,” but it’s impossible not to read this series without seeing the grim parallels with our present situation. (Ridley leans into these parallels: one character rails against “multiculturalism,” a word that would have barely been in existence in 1972.) This is all to the good, lending Those Above and Those Below an urgency its predecessor lacked. 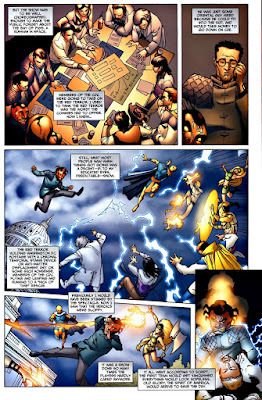 The series traces the lives of three of the suriviving superheroes from the previous series. Amber Eaton (formerly Amber Waves) has joined a Weather Underground-style radical group that’s falling deeper and deeper into political violence. Missy Deveraux (formerly Ole Miss) is running for governor of Mississippi on a George Wallace-style platform built around the Confederate flag. And Jason Fisher (formerly the New American, the first black superhero) is caught somewhere in the middle, trying to uphold a law that views him as a threat and protect a community that increasingly regards him as a sellout. 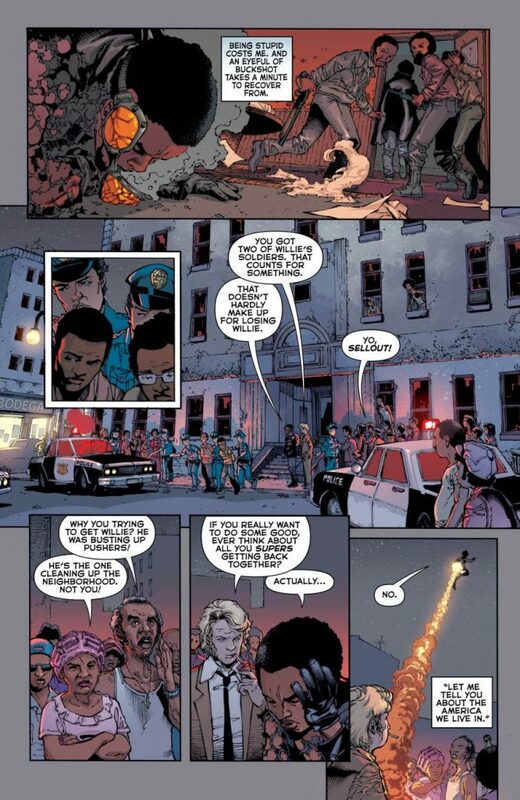 In The American Way, Ridley and Jeanty committed themselves to no less than fifteen superhumans, plus their supporting cast, leaving no room to develop any of the characters in depth. The series was so overcrowded it didn’t even introduce Jason until the second issue. Fortunately, Ridley and Jeanty pull back significantly in Those Above and Those Below. The latest issue has begun to reintroduce other characters from the previous series (one of whom, strangely enough, seems to be a different race or ethnicity now) but the creators wisely keep the focus on their leads, adding new layers instead of new players. Ridley has also become much more confident as a comics writer. The American Way was glutted with text, a telltale sign of a novice scripter who burdened his artist with unnecessary exposition. Those Above and Those Below is much more terse, communicating its character beats with an economy of words while giving Jeanty the space to establish the setting and block out the action. The story is no less rich for its smaller cast and more restrained script. Just the opposite, the extra breathing room allows for much more careful delineation of the characters and the society they inhabit. The same applies to the social commentary. Those Above and Those Below criticizes the entire political spectrum of the early 70s (and, implicitly, the present) from militant separatists to angry reactionaries, but it never falls into the cheap nihilism that marks the opening pages of Doomsday Clock. That’s because Ridley’s criticisms are always grounded in the particularities of his characters, and he approaches them with a wide-ranging empathy. All of his characters are trying to do what they think is right, but Ridley holds no illusions that this makes them all equally right or wrong. The most sympathetic is probably Jason, a defender of social norms that nobody around him seems to hold anymore. But even this portrayal is rich with irony: the hero who was most critical of the previous series’ liberal bureaucrats is now almost the only one left who’s fighting to protect a liberal-democratic society ruled by laws rather than force and fear. It was also an inspired choice to make the Wallace-style candidate Missy Deveraux, and not simply because “Ole Miss” was steeped in the imagery and traditions of the old South. Missy was one of the most conscientious and least racist members of the “Southern Defense Corps” in the last series, but her participation in a reactionary neo-Confederate campaign—the slogan is literally “Heritage, Not Hate”—serves as a reminder that racism isn’t just the province of cackling supervillains (which was too often how the old series leaned). Those Above and Those Below approaches racism as a set of institutions as well as beliefs, and reminds us that even nice, polite people can be invested in them. As Missy’s example should make clear, Ridley’s empathy for his characters doesn’t dilute his own staunchly anti-racist views; it sharpens them by allowing him to form much more subtle insights into the characters and viewpoints he opposes. The American Way: Those Above and Those Below was a long time coming, but it’s well worth the wait. An improvement in every way over its predecessor, this is a sharp and uncompromising series as well as a timely one. 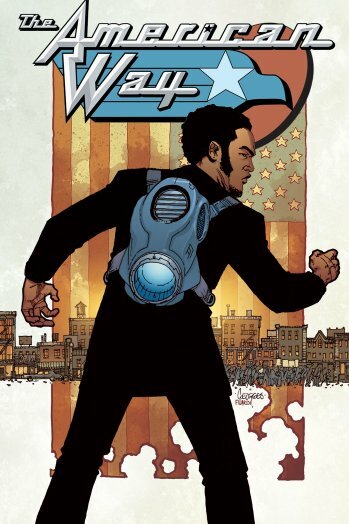 The American Way (2006) is available now in trade paperback from Vertigo. The American Way: Those Above and Those Below (2017) is currently on the shelves; the fourth issue goes on sale next week.